The shadow of the Shinra Corporation Headquarters is much less oppressive now that Second Life’s long-running Final Fantasy VII role-playing sim is lit with holiday cheer. But do the residents of Midgar’s slums know it’s Christmas? One of the first places I visited in Second Life when I first logged in back in 2007 was an adult social club, but after that an online friend accompanied me to Midgar, a sim dedicated to role-playing in the world of Final Fantasy VII. Amidst the strangeness of those early days in SL, the Midgar sim was like an anchor to reality for me, oddly enough. For nearly a decade the devoted community has been adding and updating the sim. It’s quite impressive now. 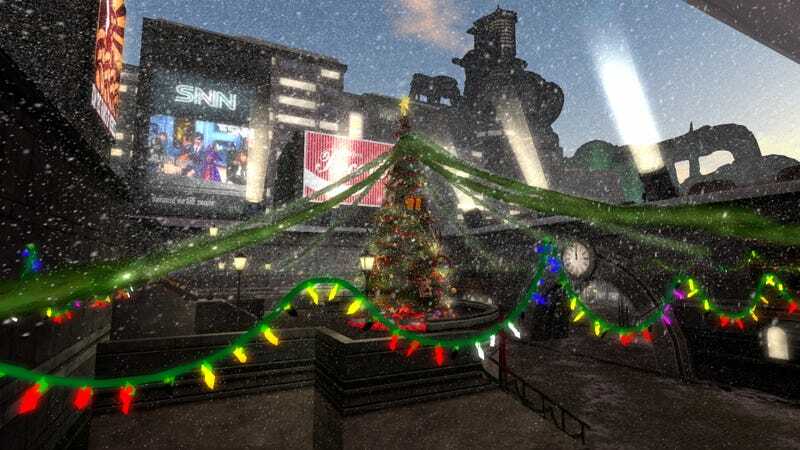 It’s been a while since I visited Second Life’s Midgar, but a post over on James Wagner Au’s New World Notes site, featuring this video of snow falling and lights strung between the neon signs and searchlights of Sector 7, lured me back. While it might feel anachronistic to some, I can easily imagine the upper crust of Midgar allotting some of their wealth and resources to prettying up the place for an annual celebration. Perhaps it’s the work of Shinra itself, an event to help distract the populace from any questionable genetic experiments it might be performing. Of course there are two sides to every Midgar sector. While the people on the plate celebrate with colorful lights and gifts, the people of the slums continue on as they always do. The snow doesn’t fall beneath the plates, nor does the light reach. Well, maybe there’s a little light. I just hope the residents of the Sector 7 slums never catch wind of the celebration going on topside. They’d be crushed. Fancy a visit? If you’ve got a Second Life avatar that’s at least a month old, just load them up and click here.